Want to be notified of new releases in OtherCrashOverride/MicroPython_ESP32_psRAM_LoBo-odroid-go? Pull request Compare This branch is 1 commit ahead, 7 commits behind loboris:master. This repository can be used to build MicroPython for ESP32 boards/modules with psRAM as well as for ESP32 boards/modules without psRAM. Building on Linux, MacOS and Windows (including Linux Subsystem on Windows 10) is supported. This repository contains all the tools and sources necessary to build working MicroPython firmware which can fully use the advantages of 4MB (or more) of psRAM. ESP32 can use external SPIRAM (psRAM) to expand available RAM up to 16MB. WiPy 3.0 board from Pycom. Lolin32 Pro board from Wemos - no longer available (Schematic). 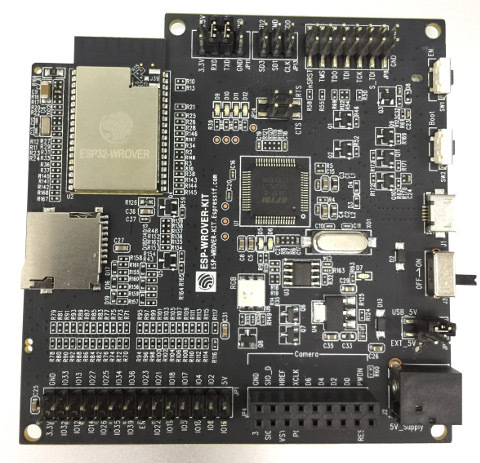 ESP-WROVER module from Espressif, available from ElectroDragon and many other vendors. ALB32-WROVER module (4 MB SPIRAM & 4/8/16 MB Flash) from AnalogLamb. S01, L01 and G01 OEM modules from Pycom. Wiki pages with detailed documentation specific to this MicroPython port are available. This means the regular esp-idf menuconfig system can be used for configuration. Besides the ESP32 configuration itself, many MicroPython options can also be configured via menuconfig. Internal Fat filesystem is built with esp-idf wear leveling driver, so there is less danger of damaging the flash with frequent writes. sdcard support is included which uses esp-idf sdmmc driver and can work in SD mode (1-bit and 4-bit) or in SPI mode (sd card can be connected to any pins). For imformation on how to connect sdcard see the documentation. Native ESP32 VFS support for spi Flash & sdcard filesystems. Eclipse project files included. To include it into Eclipse goto File->Import->Existing Projects into Workspace->Select root directory->[select MicroPython_BUILD directory]->Finish. Rebuild index. Detailed instructions on MicroPython building process are available in the Wiki. Detailed information about using MicroPython file systems are available in the Wiki. I (95) cpu_start: Starting scheduler on PRO CPU. I (4) cpu_start: Starting scheduler on APP CPU. FreeRTOS running on BOTH CORES, MicroPython task running on both cores. Running from partition at 10000, type 10 [MicroPython_1].